Could we possibly see these sketch cards made available, or will find their way to collectors via a pack from The Drawn Word? Time will tell, but keep it locked on HISSTANK.com for all things Eagle Force! 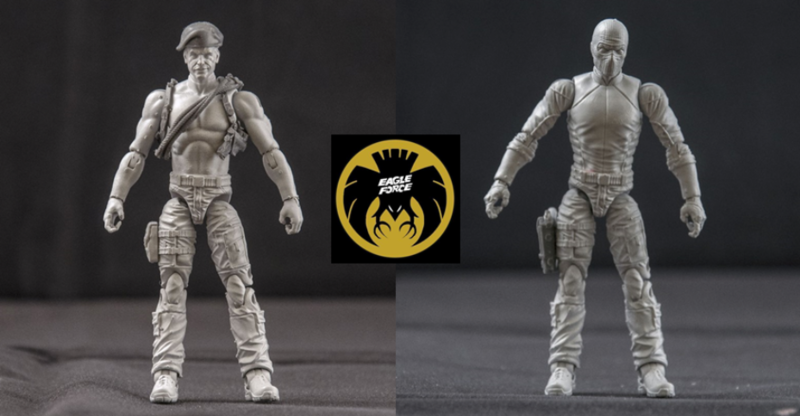 Over the weekend, the Eagle Force Returns Facebook Page was updated with “Quick & Dirty” 3D prints of the upcoming Eagle Force Cat & Hornet figures. Although these are just 3D printed figures, they look fantastic and I know I speak for many when I say I can’t wait to finally have these figures on my shelf! You can discuss the new images and all things Eagle Force Returns after the break. The campaign has added some more pieces of the Pilot, BUT reduced the amount needed to get this awesome figure to only $60.00(or over) in hopes to attract more folks to the Kickstarter! To make it easier to get in on the action, Fresh Monkey has created the R.I.O.T. Pilot Level Reward at $60; this reward will get you a limited edition metal card of Captain Eagle, a new R.I.O.T. 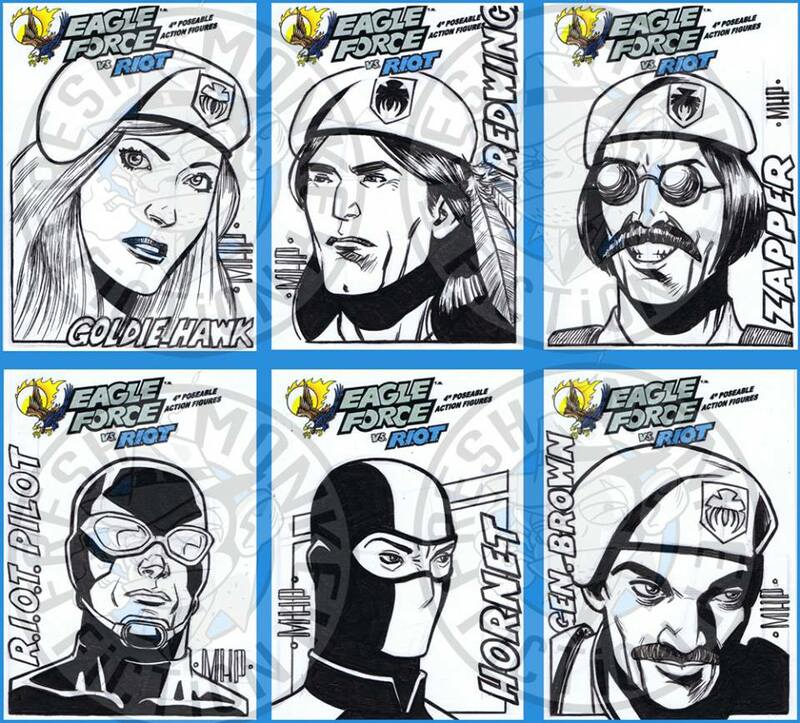 Pilot Trading Card, Plus a set of 20 Eagle Force Returns Trading Cards. All rewards over $60 will now also come with the new R.I.O.T. Pilot Trading Card. If you pledged to a reward lower than $60 you can either (a) raise your pledge amount to $60 OR (b) change your reward to the R.I.O.T. Pilot Level Reward. Fresh Monkey knows a lot of you made adjustments to your pledge yesterday to $75, so if you want you can stay at $75 (as you’ll get the cool repo backer cards) OR adjust your pledge to the $60 R.I.O.T. Pilot Level Reward. Sorry for this inconvenience but Fresh Monkey Fiction feels that this will give incentive to more folks to bump up their pledges in the long run. [04/23/16 @ 8:28am] Wow, talk about a stretch goal! Our friends behind Fresh Monkey Fiction have laid down the gauntlet – If the Eagle Force Returns Trading Card Set Kickstarter Campaign hits a milestone of $10,000, every backer who backs at $75 or over will received the very limited R.I.O.T Pilot- Air Assault Stealth Trooper figure. 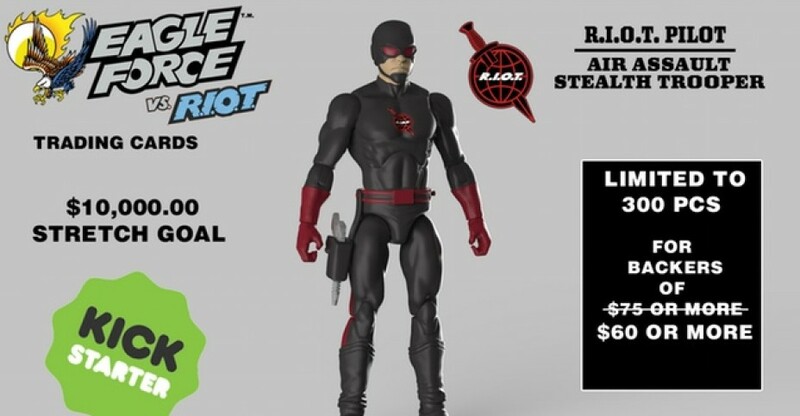 This figure will not only be the 1st Eagle Force Figure, but he will be limited to 200 pcs world wide. If the campaign is able to achieve this goal, Fresh Monkey Fiction will ship out your other rewards this summer and the figure will follow in winter 2016. With the campaign now over $4,000, every backer (over $25) will receive their card set and sticker wrapped in a vintage trading card wrapper (bubblegum not included). *Cue Salesman Voice* But WAIT! That’s not all! Fresh Monkey also stopped by to share an image of another new R.I.O.T. character, HORNET! Hornet was revealed earlier this week on AFI and he looks absolutely fantastic! You can check him out along with his bio after the break. So start spreading the word, we have 10 days to reach this goal!! !